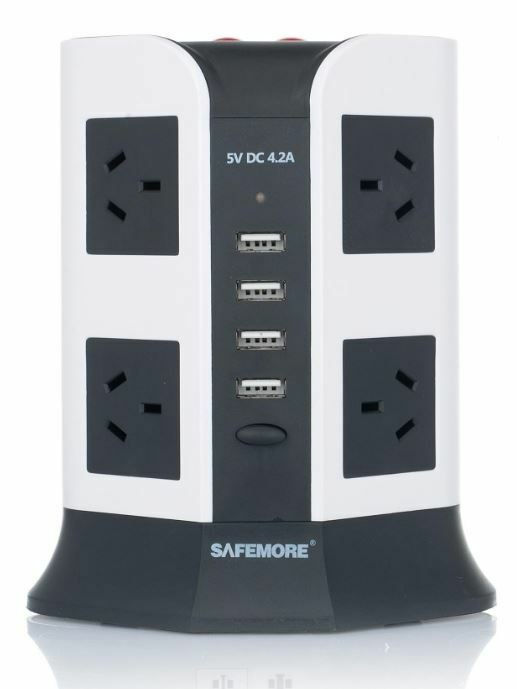 9.68% of people buy Safemore 2 Level VPS Euro + 8 Socket Power Board with 4 USB Charging (White/Black) and Safemore 2 Level Power Stackr Power Board (Blue/Orange). When it comes to powering your devices, like Dune “The spice must flow”, with the number of devices collectively taking over our homes flat power boards are ugly and most of the time you can't plug everything in because plugs can be bulky taking up valuable space. 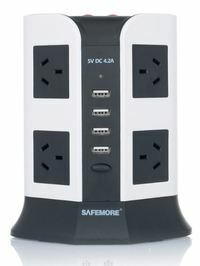 How genius is it to bring out vertical towers with 8 power sockets and 4 USB ports- I'll be looking for another for the hobby space soon. This is the best power board / tower I've never used. The USB charging is great. "Works well, though USB whine is annoying"
It does all it is meant to, though when the USB ports are on and you are charging a device, you can hear a whine, and this only gets worse when you add more devices. Ok in the lounge, but you wouldn't want it in the bedroom. Clean, Bold and modern design power board that will satisfy all your power needs. Power Stackr is a fantastic innovative power extension board, features high quality overload protected electric power outlets as well as direct USB charging outlets. It is creative designed to have more distinct advantages over old power boards you see in the market. The new Power Stackr features impoved USB ports that are capable of Charging USB devices faster. The new Smart chip design optimises the 4.2A output from the USB enabling the Power Stackr to effectively distribute the best output to multiple devices.